The initial consultation is a 90-minute session which includes intake on your dog’s history, your home environment, family dynamics and behavioral issues. We will explain the basics of positive reinforcement training and give as much foundational training information and practice as time allows. You will have plenty to work on after the session! Who should be present at the first meeting? Ideally all family members are present at the first consultation. Parents can use their own judgement about having young children at the session. It’s important for all to be involved, but also for everyone to be able to focus. Why are the follow up sessions shorter? The follow-up sessions build on the initial consult information. Becasuse we already have a history and knowledge about your home environment we can focus on your training goals and any other training issues as they arise. Virtual session are only available after the initial consult. Using Zoom, Skype or FaceTime we can have a consult online if it’s appropriate for you and your dog. This service is wonderful for Separation Anxiety dogs or dogs with such high reactivity that the trainer's presence is a trigger. Will you come and train my dog when I’m not home? We certainly can and in some situations this is a good idea. But it isn’t for everyone. We can discuss whether or not this is the right option for you and your dog. Can I email you if I have a question after we have met? Absolutely! We love to clarify any advice we’ve given. If your question is about a new behavior or something we didn’t cover in the session, it may require another session to fully cover the topic. We can make a recommendation but it depends on your schedule and how often you are able to work in between sessions. 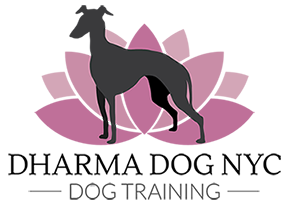 We are flexible to come at a frequency that is best for both human and canine clients. How do we decide if group classes are better for my dog? We can discuss this in person or via email. While in private session you get one-on-one information and attention and do not need to travel, group classes can be fun and give you a sense of community. They also can give your dog practice at working while distracted. We travel to most of Brooklyn, Lower Manhattan and in some cases to Queens. If you live in an area we don’t cover, we may have a great trainer to refer you to, so be sure to ask us! What forms of payment are acceptable for private sessions? We take Venmo, Paypal, checks and cash for payment. Dogs are living beings, and so it’s actually not possible to guarantee their behavior. Any being under enough stress can change their normal behavior. It isn’t ethical to guarantee a perfect dog. We can promise you however, that we will do all we can to inform you and teach you how to interact with your dog in a way that will help them continue to offer the behaviors you want! We can help your dog feel better about things that frighten or worry them, making them happier and calmer which creates wonderful behavior as a result. Why am I directed to another website for classes? Dharma Dog NYC is fortunate enough to be a part of a larger training community and teach amongst various colleagues. Their locations and tools make us more available to you. Come and join us in class! Are group classes right for my dog? That’s an important question. Many dogs are great in group classes, even if they are a little shy to start. However, if you have a dog that is highly reactive to dogs or people, you should begin with private sessions where your dog will be more comfortable and see where that leads. You should come to class with several different kinds of treats cut into tiny pieces. Bring more than you think you need and don’t feed your pup a full meal before class. You will also want a treat pouch, a flat collar or harness, and a 6 foot regular leash. No choke or prong collars are allowed, and please don’t bring a retractable leash. My puppy isn’t fully vaccinated. Can we take a class? Yes! Your pups vaccinations need to be up to date, but not completed. That’s what puppy class is for! The other pups are close in age and all dogs who take classes must be vaccinated as is appropriate for their age. I heard that socialization is most important for my puppy. Is that part of class? Absolutely. We prioritize socializing your puppy to many things in classes and discussion around how best to give them positive experiences in their world during the critical socialization window. What if I cannot make a class? The make up policies for classes vary with the class location and size. Check the host’s make up policy or email us with the class you are considering so we can let you know your options. Is there an age limit on Basic Manners classes? Nope - the only age restriction is that your dog be old enough. Can I do both private session and take a class? Of course! What rock stars you will be!